KCKCC Hall of Famer Mike Hinkle was ‘Kansas Athlete of Year’ – Welcome to Wyandotte Daily! The University of Kansas’ loss turned out to be a huge gain for Kansas City Kansas Community College. “I had several options, notably Kansas which recruited me pretty hard,” said KCKCC’s newest Athletic Hall of Famer, Mike Hinkle, who will be inducted into the Hall of Fame between the final two games of the Keith Lindsey basketball classic Friday, Nov. 10. What KCKCC got was not only a Hall of Fame baseball player but the first and only Blue Devil to be named Kansas Community College Athlete of the Year and a vital contributor to the winningest team in college history who would go on to earn All-Big Eight and COSIDA Academic All-America honors at Kansas State and enjoy success at the professional level. A member of the first start-to-finish graduating class at Sumner Academy of Arts and Sciences, Hinkle was a four-sport star earning honors as a quarterback, defensive back and punter in football and a shooting guard in basketball where he helped the Sabres reach the state tournament as a junior. He also played on a state champion American Legion baseball team. At KCKCC when he wasn’t playing centerfield, Hinkle was pitching, hitting .319 with five home runs and nine doubles while compiling a 6-2 record with a 2.66 earned run average on the mound as a freshman. In 58 innings, he struck out 54. His sophomore year, Hinkle was 10-2 with an ERA of just over 3.0 in a 53-13 campaign that saw the Blue Devils come up just short of a World Series berth, losing to Connor State in a three-state district playoff final. Hinkle took a .369 batting average with nine home runs and 44 RBI into the playoffs and a record of 122 plate appearances without striking out. He also played a major role in by all accounts the greatest game in KCKCC history. As hosts of Allen County in a playoff game, the Blue Devils trailed by two runs in the top of the ninth when on a 3-2 pitch with runners on second and third and two out, Chris Zych homered over the scoreboard in left for a one-run lead. Then in the bottom of the inning, Hinkle on back-to-back fly balls reached over the fence to take away home runs. “The fence was short because I was not very tall (5-10) and didn’t jump that well,” Hinkle remembered of his game-saving catches. One out later, first baseman David Segui made a leaping catch of a foul fly over the fence to end the game. Sweeping Butler, Barton and Seward in the regional tournament, KCKCC advanced to the three-state district tournament but came up short of a World Series berth by a loss to Connor State in a 53-13 campaign that is KCKCC’s all-time best. With a 3.8 GPA with straight A’s his next to last semester, Hinkle was named the Kansas Community College Athlete of the Year and the KCKCC Presidential Outstanding Athlete Award, which was based on athletic ability, scholastic achievements, leadership qualities and overall personal conduct. At Kansas State, Hinkle hit .283 with 35 RBI as a junior while compiling a 3-2 record with a 4.91 ERA on the mound and then exploded at the bat as a senior, hitting a lusty .376 with eight home runs and 48 RBI. When injuries crippled the pitching staff, he stepped up with a 5-3 record and stingy 2.98 ERA and a first team All-Big Eight berth as a utility player. “I think they created a position for me because they did not want to leave me off the team,” Hinkle said. “I think Gary Ward at Oklahoma State did it because I hit about .600 against them.” Also a star in the classroom, he was named to the COSIDA Academic All-American second team. Drafted as a pitcher in the 24th round by the St. Louis Cardinals in 1987, Hinkle pitched seven scoreless innings in the final playoff game as AA Little Rock won the Texas League championship in 1989. That chance never really came. 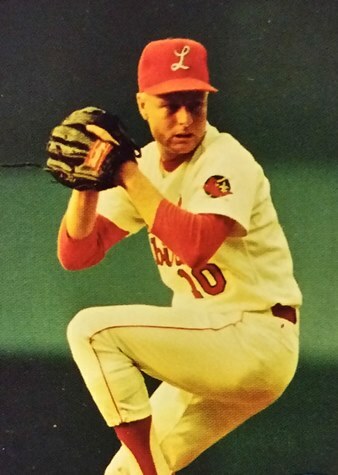 After a successful season with the Cardinals Triple-A team in Louisville, Hinkle underwent rotator cuff surgery in the 1991 off-season. For one season, he pitched in the Italian Baseball Federation in Bologna. “To live among the locals, understand another culture and play in another part of the world I would never access again was a great experience,” he said. The year also revitalized his pitching arm and with an impending major league in 1995, the Cardinals came calling again. A compliance consultant with American Century Investments for the last 18 years, he and his wife, Heather Hinkle, live in Shawnee. The rest of the family consists of boy and girl twins, Colton and Addelyn Hinkle, who are seniors at Mill Valley High School and two step-daughters, Chloe and Mattie Weck. With Greg Wells, they’ll be the 18th and 19th KCKCC Athletic Hall of Fame inductees. “It’s been 32 years since I was a student athlete there (at KCKCC) and to think I can still be thought enough to be considered for this honor is pretty humbling and gratifying,” Hinkle said.